Definition at line 15 of file po.h. Definition at line 20 of file po.h. Definition at line 33 of file po.h. Definition at line 230 of file po.h. Definition at line 363 of file povolume.c. Definition at line 396 of file power.c. Referenced by KiInitializeKernel(), and KiSystemStartupBootStack(). Definition at line 296 of file power.c. Definition at line 39 of file events.c. Definition at line 147 of file events.c. Definition at line 63 of file power.c. Referenced by PspExitProcess(), and PspExitThread(). Definition at line 229 of file povolume.c. Definition at line 244 of file poshtdwn.c. 298 * but it shouldn't be called here. Only phase 2 should be called. Definition at line 32 of file poshtdwn.c. Definition at line 315 of file poshtdwn.c. Definition at line 231 of file power.c. Definition at line 105 of file povolume.c. Definition at line 83 of file povolume.c. Definition at line 27 of file power.c. Referenced by NtSetSystemPowerState(), and PopGracefulShutdown(). Definition at line 29 of file power.c. 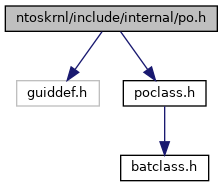 Referenced by NtPowerInformation(), PoInitSystem(), and PopAddRemoveSysCapsCallback(). Definition at line 28 of file povolume.c. Referenced by PoInitSystem(), PopGetDope(), and PoRemoveVolumeDevice(). Definition at line 25 of file power.c. Referenced by IopGetSystemPowerDeviceObject(), and IopInitializeDevice(). Definition at line 27 of file povolume.c. Referenced by PoInitSystem(), PopFlushVolumes(), PopFlushVolumeWorker(), and PoVolumeDevice(). Definition at line 26 of file povolume.c. Referenced by PoInitSystem(), PopFlushVolumes(), PopFlushVolumeWorker(), PoRemoveVolumeDevice(), and PoVolumeDevice().